With its ample array of tech features and its family-centric approach to driving, the 2018 Honda Odyssey is one of the highlights of our Aberdeen, WA Honda dealership. Filled with safety technology and including Magic Slide seats, this Honda minivan demands your attention. 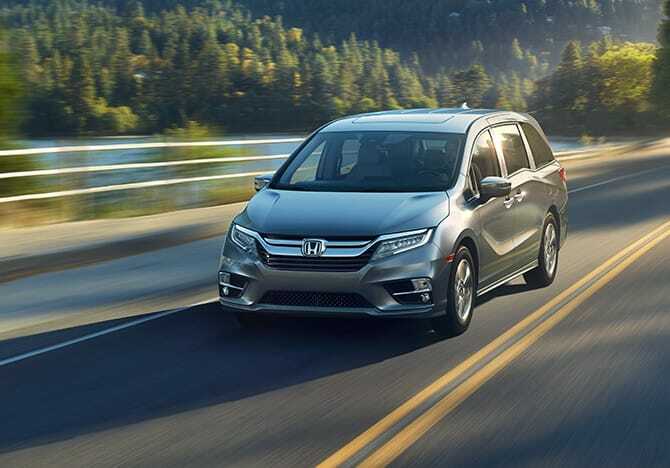 We invite you to visit Honda of Grays Harbor and test-drive it for yourself to discover how smoothly this aerodynamically-designed minivan runs on the road. Thanks to a lower weight and a higher level of vehicle control, the 2018 Honda Odyssey delivers exceptional driving performance in an affordable package. Although available in LX, EX, EX-L, EX-L Nav & RES, Touring and Elite trim levels, this Honda minivan sports a 3.5-liter V6 engine that generates 280 horsepower. Mated to your choice of nine-speed or 10-speed automatic transmission, the 2018 Honda Odyssey has plenty of options for great driving pleasure. The 2018 Honda Odyssey also has some great features that make it especially easy to drive. Active grille shutters, along with this Honda minivan's aerodynamic design, enhance its ability to perform on the open road. If you have younger passengers in the second and third rows, a special camera allows you to keep an eye on them without turning your head. The 2018 Honda Odyssey makes an especially safe, comfortable drive for you and your passengers, and we encourage you to test drive it at our Honda dealership serving Olympia, WA. Standard safety equipment across all trims includes side airbags with rollover sensors, driver and front passenger knee airbags, and a rearview camera. Advanced trims offer features like front and rear parking sensors, forward-collision warnings with automatic emergency braking, and adaptive cruise control. Special features in this Honda minivan include Magic Slide® seating, Bluetooth® and USB connectivity, and the optional Honda Sensing ® package. Visit our dealership located at 1720 Simpson Avenue in Aberdeen, WA and indulge your curiosity by checking out the 2018 Honda Odyssey. Our staff is ready to help you find, finance, and drive home in the Honda vehicle of your dreams.